Panelists Nate Silver (from left) of FiveThirtyEight, Nate Cohn of The Upshot, and David Rothschild of Microsoft Research spoke during a conference about the field of data analytics and its potential applications to politics. Since a little-known senator from Illinois named Barack Obama marched to the presidency in 2008 thanks in part to cutting-edge number crunching, the use of data to identify and target specific voters with specific information has become an essential campaign tool, as fundamental as traditional polling and focus groups. But even as the emerging analytics field becomes more mainstream, the bizarre twists and turns of the 2016 primary season, particularly on the Republican side with front-runner Donald Trump, has made predicting the next president more difficult than ever. Because the U.S. primary system embraces a fraction of the electorate, “anyone who can drive extreme messages that stimulate turnout can game the system,” said Mark Penn, a former pollster and strategist who has consulted for Bill and Hillary Clinton, during a conference on politics and data analytics Friday organized by Harvard’s Center for American Political Studies. In explaining the rise of Trump, statistician Nate Silver, the founder and editor in chief of FiveThirtyEight.com, said the 2016 race has shown how small sample sizes often yield volatile predictions. Even so, it’s unlikely that Trump’s broad demographic and geographic appeal would have been accurately pinpointed earlier on because no one has built a model for predicting outcomes of the primary nomination process because of its complexity. 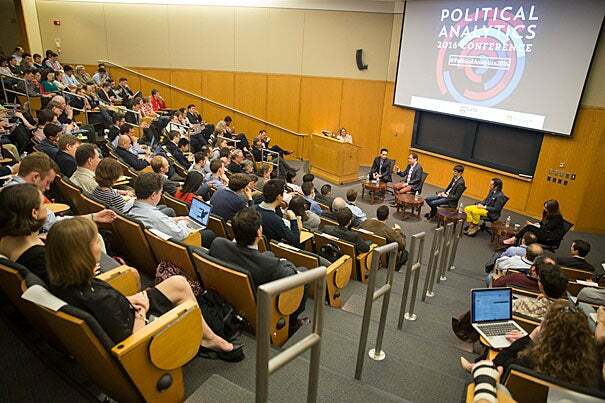 While professional sports has embraced data metrics for years to better evaluate player and team performance and predict wins and losses, conference organizers Ryan Enos, an associate professor in Harvard’s government department, and Kirk Goldsberry, a visiting scholar at Harvard’s Center for Geographic Analysis, say political analytics doesn’t have anything like the well-known MIT Sloan Sports Analytics Conference. So they brought together many of the top minds in data analytics, high-level political professionals from both parties, and political journalists such as Silver, opinion research consultant Kristen Soltis Anderson, retired U.S. Rep. Barney Frank, MSNBC reporter Steve Kornacki, and CBS News director of elections Anthony Salvanto, to evaluate the analytics field’s strengths and weaknesses, assess the nomination races on both sides, and, naturally, talk about how to use numbers to determine who wins and loses. “We can read anything online now, but it’s about getting people in the same room where they can have a conversation where we think that the field can be pushed forward,” said Enos. They plan to host the conference again next year. Perhaps surprisingly, betting markets are one area where predictions on political winners and losers remain solid, said David Rothschild, an economist for Microsoft Research who studies how users engage with online data and polling. Soon the field of polling will be entirely Internet-based and done on mobile devices, he said. “We’re not that far away from the point of the idea of a telephone poll is going to be ridiculous,” he said. That evolution will raise new methodological challenges for the industry, since the data will include more variables and so will demand more skillful analysis. Despite the abundance of data from which analysts today can draw, like voter files, polling results, voter lists, and consumer data, such information can be both expensive and hard to get at because companies like Google and Twitter keep proprietary data such as searches close to the vest, Cohn said. Illinois Sen. Mark Kirk (right) and Judge Merrick Garland, President Barack Obama’s choice to replace the late Justice Antonin Scalia on the Supreme Court. The GOP freeze has recently shown signs of thawing, as more than a dozen Senate Republicans have said they would meet with Garland.